Aero Tech Designs Women's Peace Rider Padded Bike Shorts Peace, Love, and Bicycles! 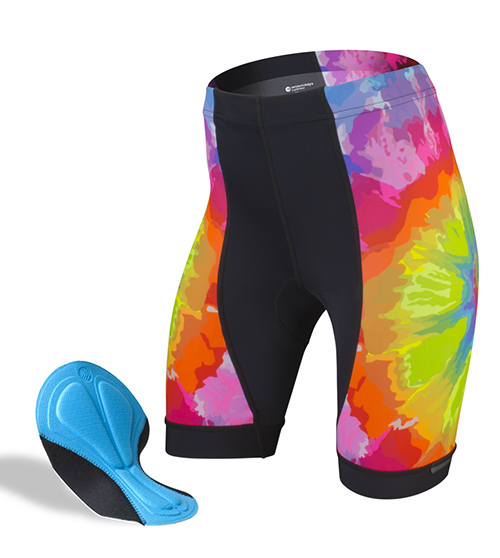 Get groovy with this vibrant women's Peace Rider Cycling Shorts, created by Aero Tech Designs! These shorts offer complete freedom of movement, thanks to our performance-enhanced materials. The fabric stretches to move with your body through the cycling motion, almost like a second skin. An essential part of the design is the Powerband leg elastic securely attached to each leg which are soft, stretchy and easy to wear. They help keep the shorts in place for the ride instead of riding up. You never need to think about the shorts, so you can Ride Longer and Feel Stronger! A soft elastic waistband also keeps these bright, vibrant shorts in place, with an elastic-free section in the front for added comfort. These far-out shorts also feature 3M Scotchlite reflective elements for rider visibility in low-light and nighttime riding conditions. What also makes this bike short great is its high Lycra Spandex blend because it is important for muscle support and maximum stretchability. It delivers a range of stretch and recovery power designed to help you move and perform at your best, while feeling comfortable. The Lycra knitted into the fabric provides high grade compression and support during intense workouts. The fabric is pre-shrunk, colorfast and machine washable. Garments that include Lycra have a number of advantages besides being able to stretch. Lycra allows garments to be more lightweight, comfortable, and breathable. It also is resistant to bacteria and helps block out ultraviolet (UV) rays, for when you're out on the beach or spending time in the park. No need to worry about wrinkles or static either since those are eliminated with Lycra. 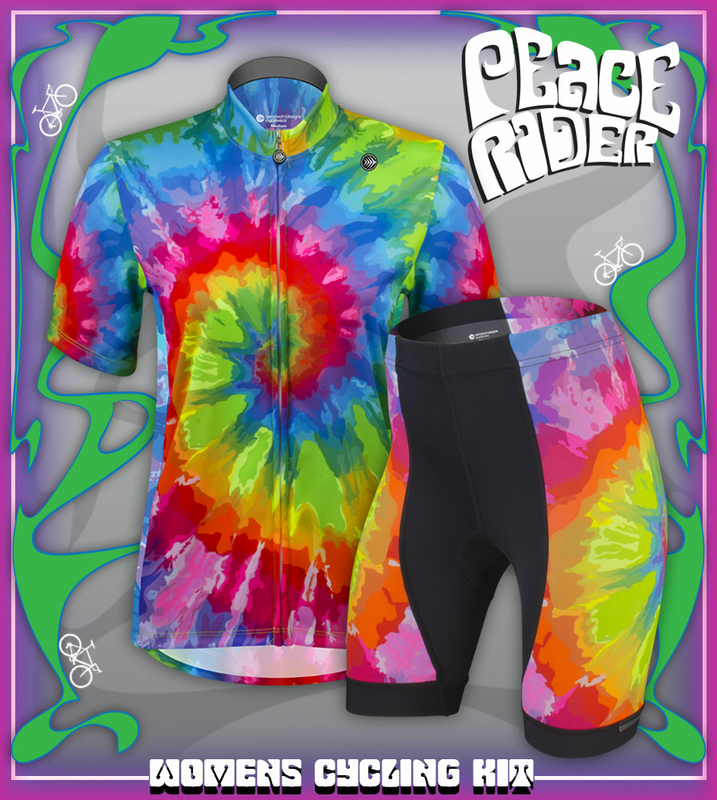 The colorful psychedelic swirl design on the Peace Rider cycling kit is inspired by the original old school tie-dye t-shirts. The spiral tie-dye jersey design is sublimation printed onto the fabric in Aero Tech Design's own US-based apparel factory with fluorescent inks to bring out that brilliant, bright color. These far-out colors will not fade! These brightly colored cycling shorts will keep you visible on the road and will surely turn heads as you bike past them. You might even get a few fellow cyclists give you a bike gloved peace sign! Check out the matching Women's Peace Rider Cycling Jersey. The bike shorts use our Top Shelf chamois pad so you can Ride Longer and Feel Stronger. The Top Shelf chamois pad is anatomically designed for the bike riding position. It uses multi-level production technology to improve comfort by relieving the pressure points between the body and the bicycle saddle. It is a fantastic fit that comes from a highly engineered design that fits all the curves between the legs and around the body's pelvic area. The side wings on this pad also offer up excellent fit around your legs and torso. The surface of the chamois pad is antibacterial which is important to prevent the growth of bacterial which can lead to saddle sores for long distance cyclists. 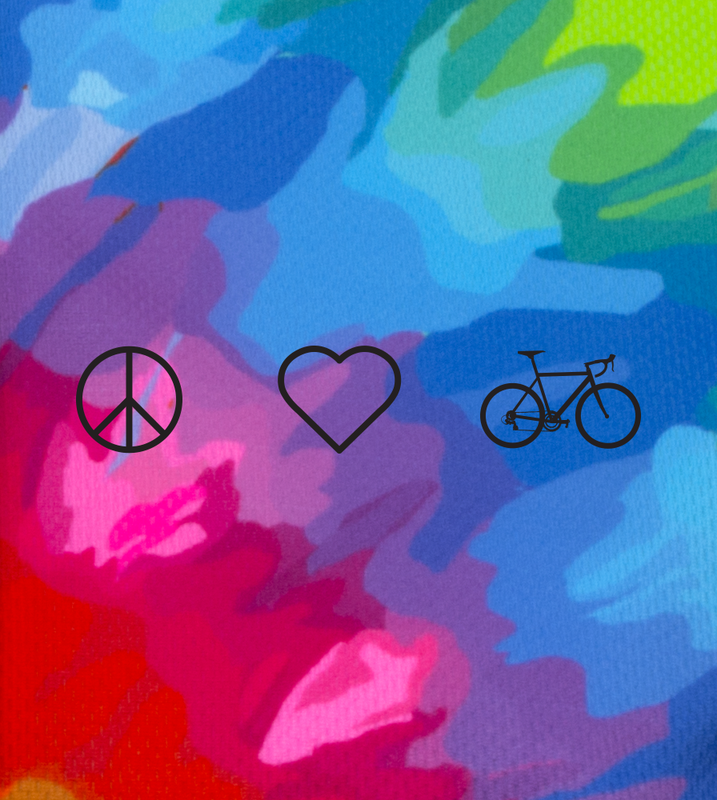 If "Peace, Love, and Bicycles" is your life motto, these cycling shorts is made for you. Be a Peace Rider! Ride longer. Feel stronger. A FAR-OUT VIBRANT CYCLING KIT FOR WOMEN! Women's Peace Rider Padded Bike Shorts Made in USA! I wore these on the NC Mountains to the Coast bike ride. They were very comfortable and I was fine on the longest legs of the ride - 70 to 75 miles. Everyone loved the 60's look and I received many compliments on the appearance of the shorts. A win-win.